but not too many in the same day. but I loved my Easter baskets. 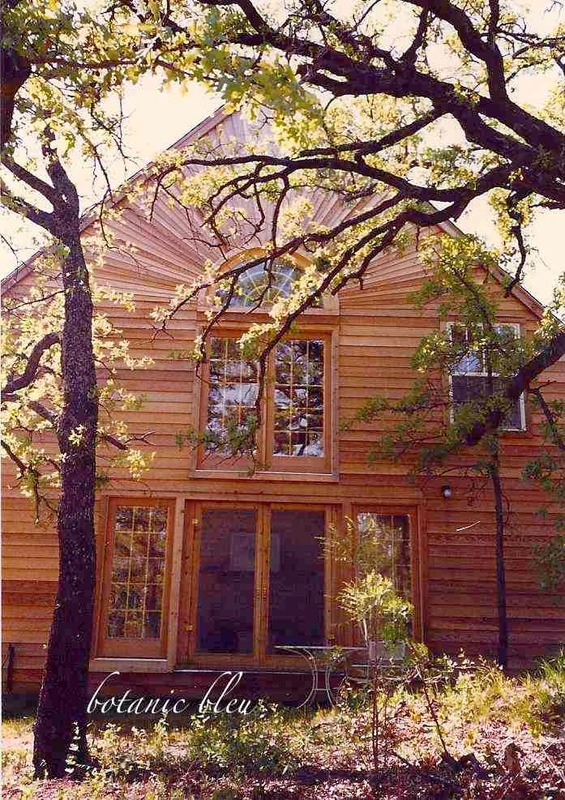 that was refinished last year. that has been home to others before him. Last fall, the twiggy basket nestled an unusual colored pumpkin. but quickly settles back into his twiggy basket home. when the rabbit becomes an Easter bunny. Very pretty, Judith! 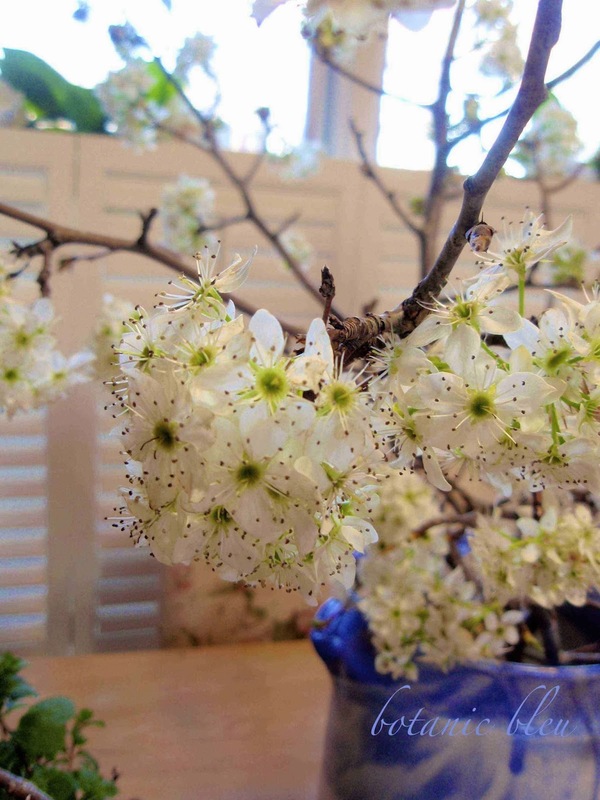 This makes for a great table centerpiece. I'm a bunny nut so I love the bunny, of course, but I really love the look of the basket, too. He fits perfectly in there! 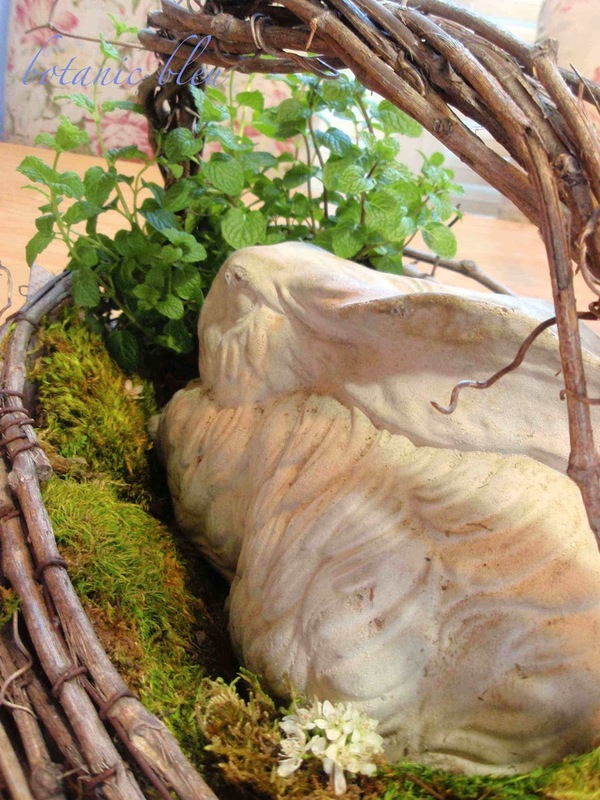 Mr. Bunny looks right at home nestled into that wonderful twiggy basket. A few of his friends have hopped out of storage and settled in around here too. Love this time of year! 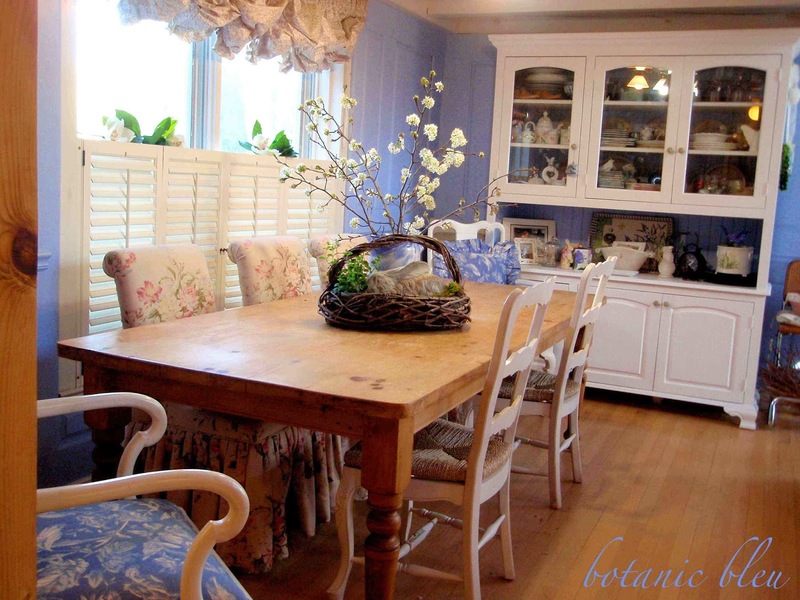 Thanks for sharing your pretty table top vignette. What a lovely room to enjoy. 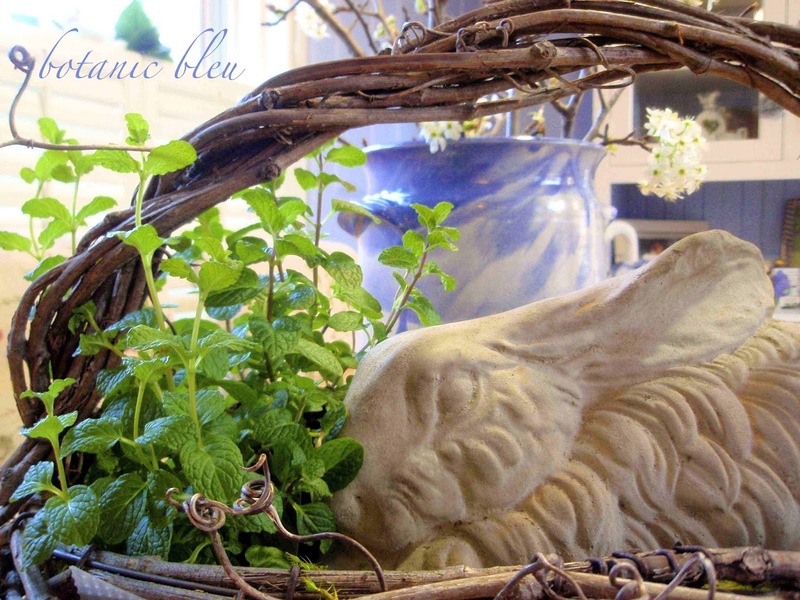 Bunnies and baskets are always so pretty and yes, I remember those big Easter baskets filled with treats! A solid chocolate bunny was my favorite! Sweet hugs! Oh, I love your sweet Easter basket. I do believe your bunny is nibbling on the greens though. 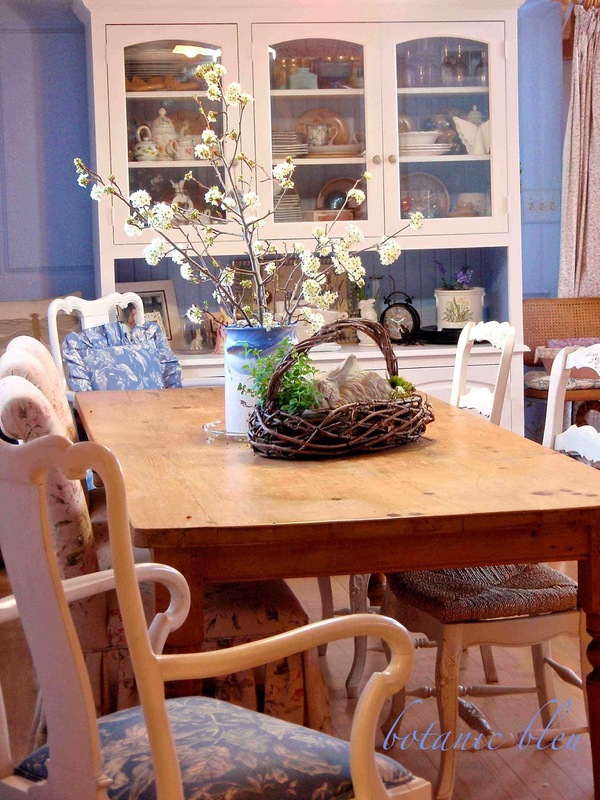 :) What a lovely room and it just screams - spring! I've heard there is going to be some bloggers meeting in Galveston in September. I live in Galveston! I have a thing for baskets too, mine growing up for Easter was pink and purple. 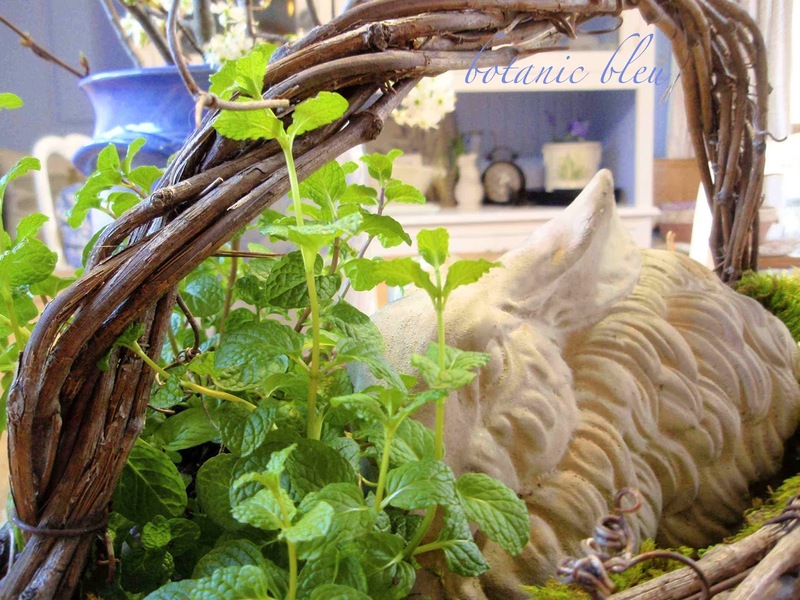 I like this shallow one on your table with the bunny and mint. 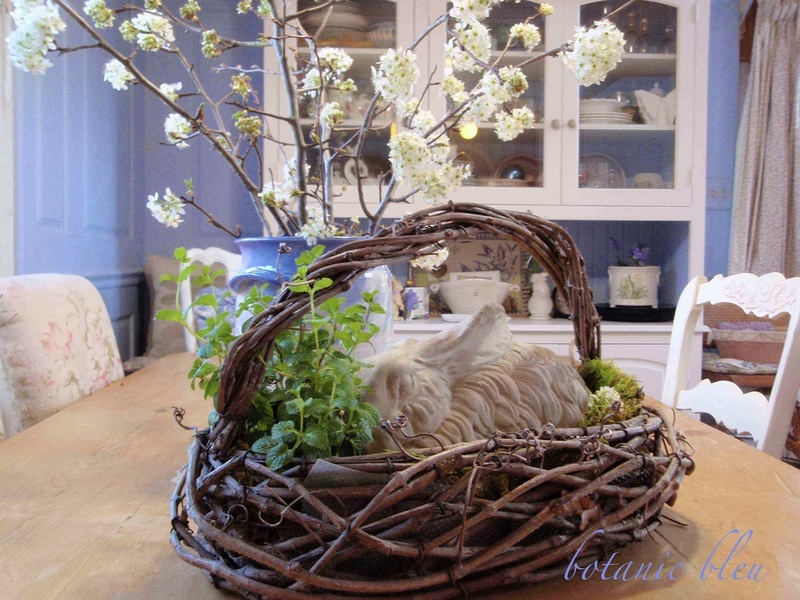 Love the rabbit in the basket, so cute. You have a vey lovely dining room. 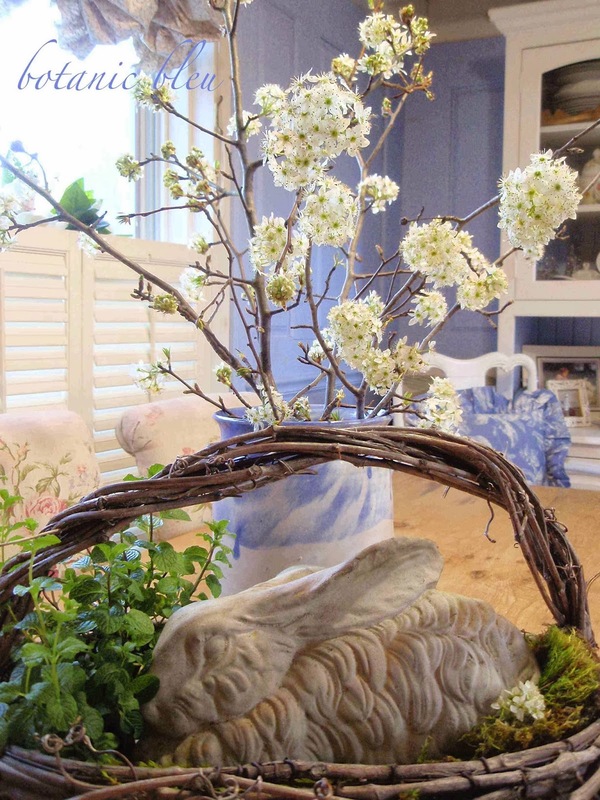 Hi my friend~ I love the vintage bunny and he is at home in that twiggy basket. 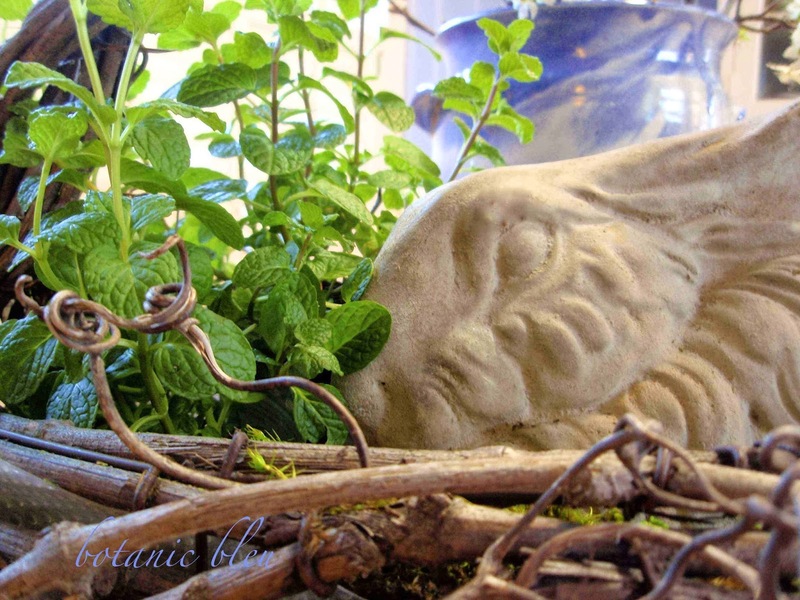 What a lovely, lovely centerpiece; especially with the mint. You always have the most creative ideas. By the way, I love your festoon shade on the window. I'm not sure why it has never grabbed my attention before, but it is very beautiful and just perfect for the dining room. Hugs Judith! 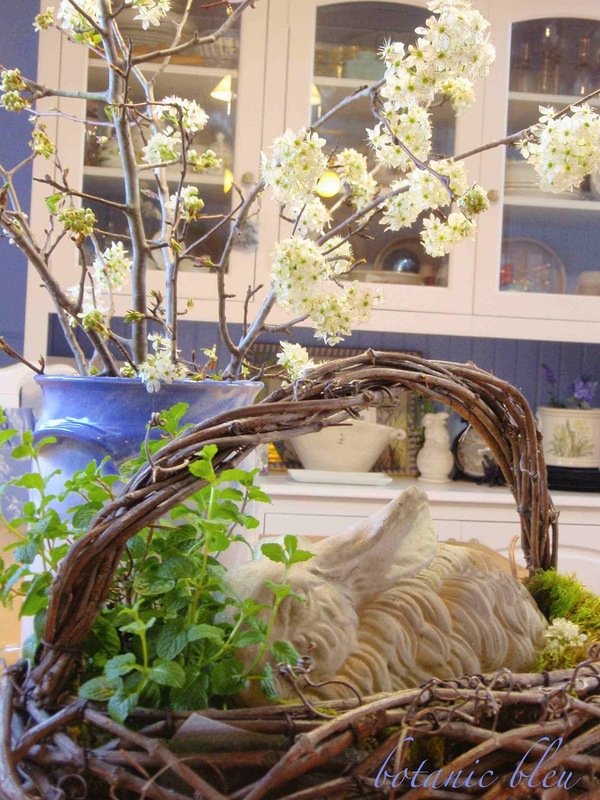 Very sweet Easter basket/centerpiece! You have created a very beautiful space! Love the blue on the walls! My first visit...saw you at Dwellings and had to come over and sit a spell! 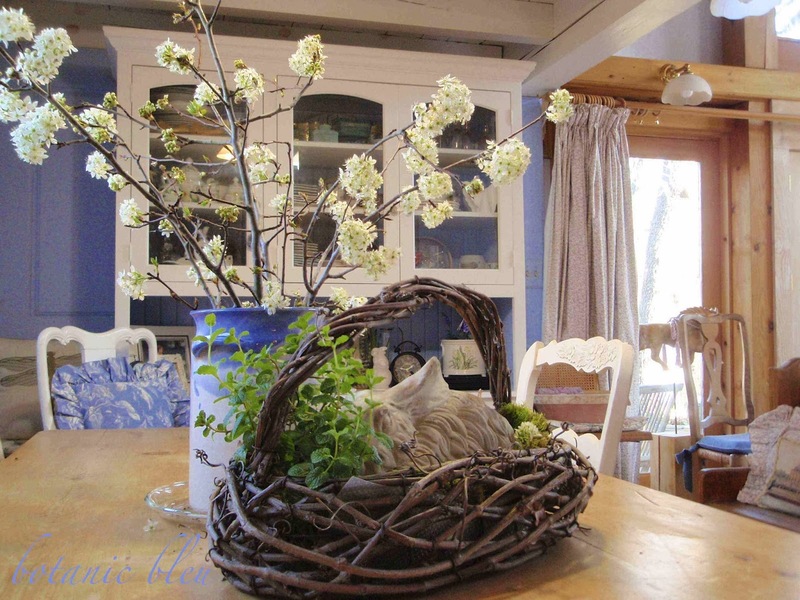 LOVE your basket and will be making one similar....Happy Monday! will be following you now!